So yesterday was my brother’s birthday. There are two things in the world that he is very passionate about–Deadpool and 101 Dalmatians. So how do you combine the two into a themed birthday party? 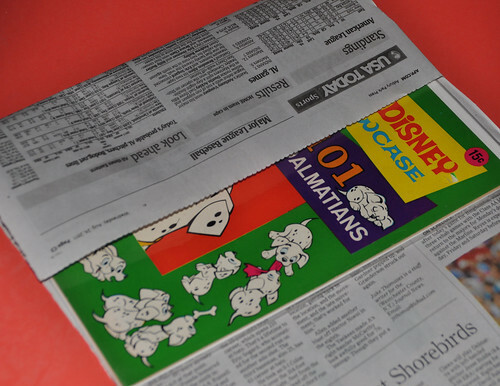 Well it can be a little tricky, since there isn’t any 101 Dalmatians party supplies to be found. And forget Deadpool. So with a little bit of work and some use of Google, I came up with a plan. This plan would make Martha Stewart cringe, but I’m no Martha Stewart. So what to do? I followed the advice of all-around awesome person Amy Sedaris, author of Simple Times: Crafts for Poor People. I did it myself. I went back and forth on whether I would theme everything with the puppies or Deadpool, but wound up going with the mercenary with the mouth. First part was to make a birthday card. I remembered that the cover of Deadpool #23 had him jumping out of a cake, so that would be the cover. 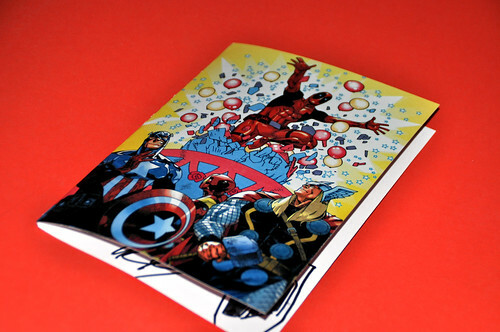 A high quality print on glossy cardstock makes the perfect card! But we need to personalize it a little more on the inside. Write a message that is appropriate with the image on the cover. Party animal? 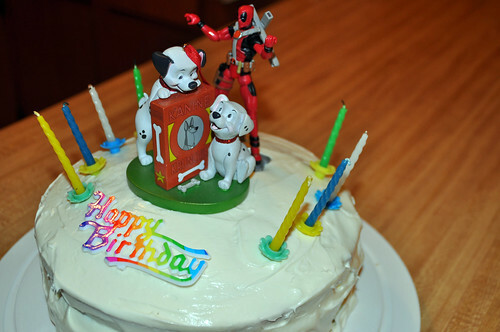 Deadpool jumping out of a cake? Works for me. 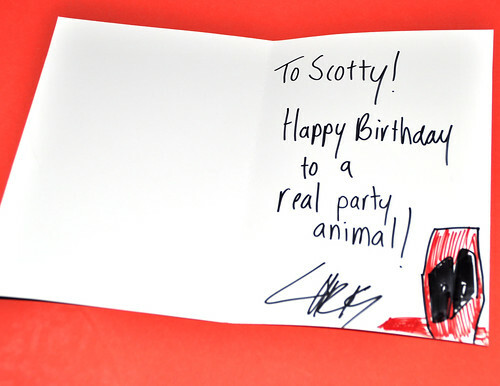 Also, add a little sketch or doodle or something to personalize it; definitely a fun little way to liven it up. 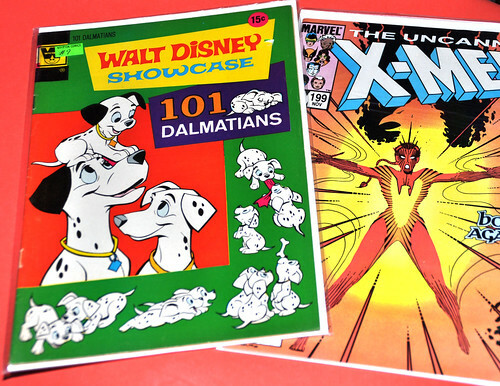 For you nosy-nellies, little brother got some old-time X-Men and 101 Dalmatians comics, as well as the Marvel Legends Deadpool action figure. All of which were purchased at the Baltimore Comic-Con the other weekend. Now to make some wrapping paper. 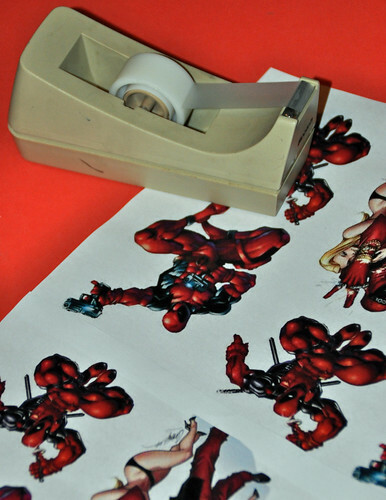 I found some pics of good ol’ deadpool with a white background. They were pasted into a blank Microsoft Publisher document and resized/arranged. Print out a whole bunch of these to wrap everything. I chose to not fully print the paper to save some money. But wait a minute, you say. Can you see through the paper? Well the answer is yes. And that’s where some ingenuity came in handy. 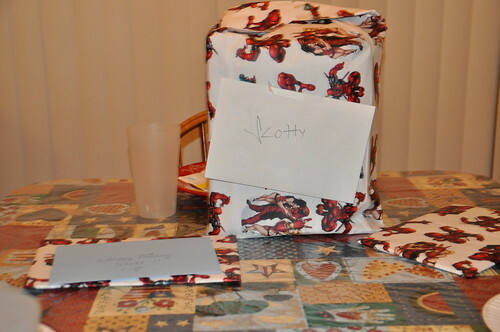 I prewrapped everything in a sheet of newspaper. That was just enough to make sure you couldn’t see what was inside. You could probably use tissue paper too, but again my concern was to do this as inexpensive and quick as possible. See how awesome that looks? You can’t even see what’s inside. And voila, the final project! 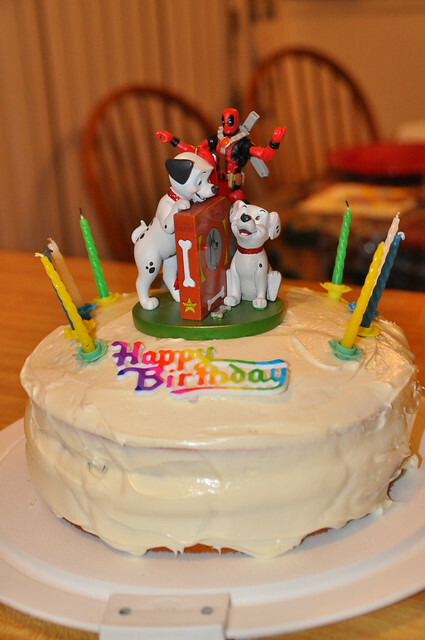 Happy Deadpool Birthday! Now for the cake, which is always important. It was a triple-layer cake vanilla cake, wich chocolate frosting in the inside and vanilla on the outside. Decorations come from a Marvel Universe Deadpool action figure and a Christmas ornament with Lucky and Rolly watching their favorite television show, Thunderbolt. Eat your heart out Cake Boss. This entry was posted in Uncategorized and tagged 101 dalmatians, birthday, cake, card, deadpool, diy, gift wrap, party, presents, wrapping paper by Chris. Bookmark the permalink. You are the coolest brother ever to exist.